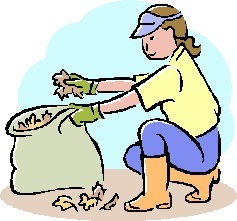 On the second Saturday of every month between April and October 2012, Mentor Recycled Landscape Materials will accept yard waste (natural products only: brush, logs, limbs, leaves, clippings, tree stumps) in paper bags (no plastic) or by the truckload. The organic materials will be reclaimed and recycled into the company’s all-natural compost mulch product, Mentor Pride Mulch. Dispose of your yard waste, do it for free, and keep it out of the landfill. If you attend one of the Cuyahoga County Solid Waste District’s excellent Backyard Composting Seminars (2012 schedule), you ‘ll hear about a great way to destroy sensitive documents and protect your identity: shred the documents and put them into the compost pile. Once it looks like this, it's safe from identity theft. 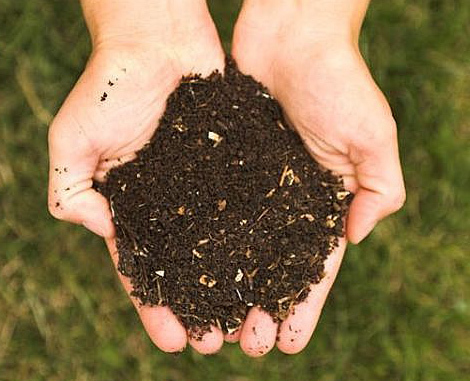 Every backyard compost pile (or compost container) needs a proper balance of green and brown organic matter. A good ratio is 30% green (nitrogen-containing material: vegetables, fruits, flowers, coffee grounds, grass clippings, etc.) 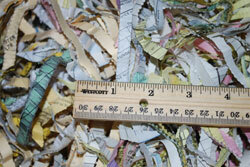 to 70% brown (carbon-based material: straw, wood chips, shredded paper, corn stalks, nut shells, etc.). Once you shred your cancelled checks, credit card statements, and other sensitive documents, just add them to that lovely compost container in the back yard and let them decompose with the rest of your organic discards. Who’ll want to touch them after that? And if you want to really discourage people from rooting through the pile, add some fresh horse manure. It’s available free to Cuyahoga County residents from the Cuyahoga County Fairgrounds horse barns. For more information, check the Composting page on the Cuyahoga County Solid Waste District website. Be safe: take your discarded drugs to a National Take-Back Initiative collection site. On Saturday, April 28, Cleveland-area governments are offering their communities a safe, convenient way to get rid of unwanted and expired prescription drugs. Local residents can take their leftover pills, liquids, syringes, inhalers and other medicines to a nearby collection site, where they will be accepted and disposed of, no questions asked. If tossed into the trash, they may end up in the hands of scavengers who will resell them, or they will end up in the landfill as toxic waste that contaminates groundwater. For more information about the National Take-Back Initiative, see the U.S. Department of Justice Drug Enforcement Administration website. A complete list of collection sites nationwide is available through the NTBI search page. This is a cat guarding his new house. The forever-in-the-landfill plastic shopping bag has pretty much displaced the paper bags that carried our grandparents’ groceries home, but some stores still offer paper. So, of course, I have accumulated quite a few (use it up, wear it out …). Our local humane society wants them! They open the bags and put them into the cat cages, where the kitties turn them into playhouses and hiding places. Of course — anyone who has lived with a cat knows how that works!